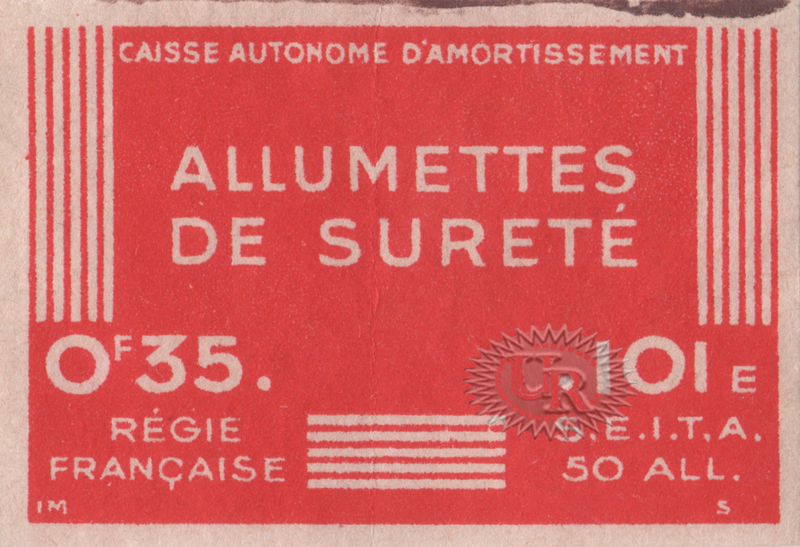 В 1938 году на коробках вместо надписи Manufactures de l’État – Contributions indirectes » (Произведено государством, непрямое участие) стали печатать надпись: «CAISSE AUTONOME D’AMORTISSEMENT / RÉGIE FRANÇAISE / S.E.I.T.A.”АВТОНОМНЫЙ СОВЕТ АМОРТИЗАЦИИ / ФРАНЦУЗСКАЯ ГОСУДАРСТВЕННАЯ МОНОПОЛИЯ / S.E.I.T.A.) 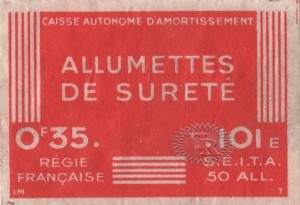 50 безопасных спичек. 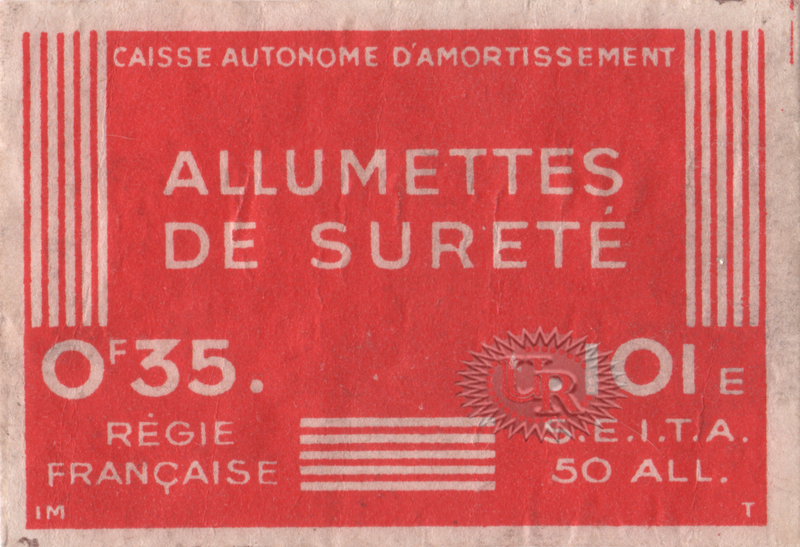 Цена коробка (тип 101Е) в 1938-1939 годах была 0.35 F (35 сантимов). 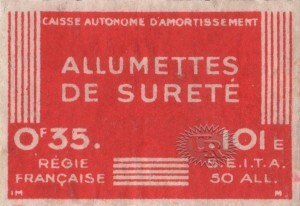 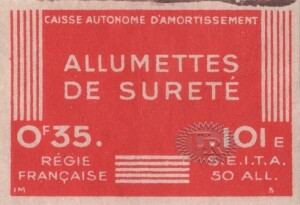 In 1938, the inscription on the box changed from «to «Compagnie Générale des Allumettes Chimiques pour la France et l’étranger» (General company of chemical matches for France and abroad)» to: «CAISSE AUTONOME D’AMORTISSEMENT / RÉGIE FRANÇAISE / S.E.I.T.A.”( AUTONOMOUS BOARD OF AMORTIZATION / FRENCH STATE MONOPOLY / S.E.I.T.A.). 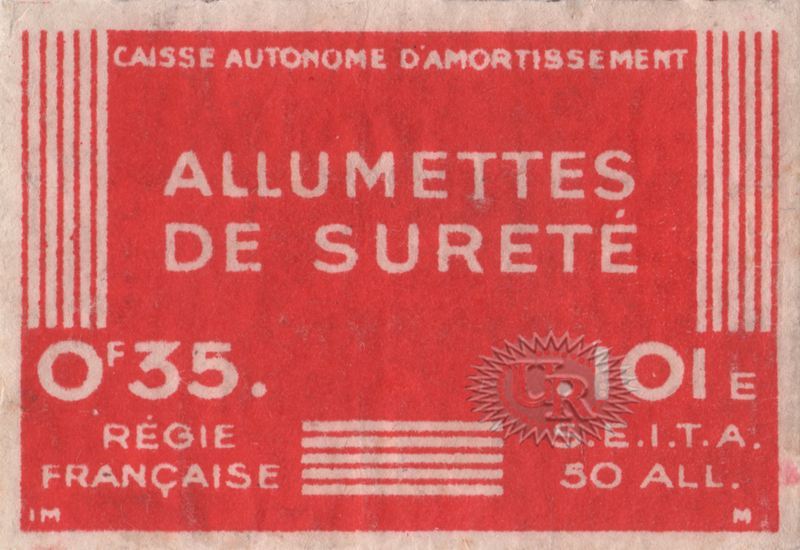 Price of the matchbox in the years 1938-1939 was OF35 (35 centimes).